Revised and expanded, A Practical Guide to Bankruptcy Valuation both practitioners and students navigate the complex task of valuing a bankrupt or other financially distressed business, and provides practical guidance on the selection and application of valuation approaches, methods, and procedures. This book contains a wealth of updated information on how solvency and capital-adequacy analyses, creditor-protection issues, debtor-in-possession financing, fraudulent conveyance and preference claims, restructuring of debtor securities, sale of bankruptcy estate assets, plans of reorganization, staffing costs, bankruptcy taxation issues, and fresh-start accounting issues, among others, are factored into properly valuing a bankrupt company. Interspersed with helpful charts and hypothetical examples (some based on real cases), this manual describes the generally accepted approaches for valuing the assets and securities of a financially troubled business. It also provides professional guidance to troubled-company managers, debt-holders and other creditors, equity-holders and investors, bankruptcy counsel, juridical finders of fact and other parties to a bankruptcy proceeding, including those called upon to be expert witnesses in bankruptcy cases. 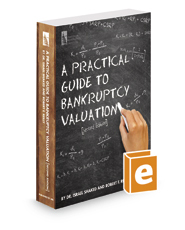 Based on the authors' combined 75 years of experience in the valuation field, A Practical Guide to Bankruptcy Valuation lays a solid foundation for those seeking a better understanding of valuation in the bankruptcy context.